India shares 3323 Km (including Line of Control (LoC) in Jammu & Kashmir sector) of its land border with Pakistan. This border runs along the States of Gujarat, Rajasthan, Punjab and Jammu & Kashmir. The Indo-Pakistan border has varied terrain and distinct geographical features. This border is characterized by attempts at infiltration by terrorists and smuggling of arms, ammunition and contraband, the Line of Control being the most active and live portion of the border. India fenced and flood-lit 461 kms of Punjab’s border with Pakistan from 1988 to 1993. The 1,048 km Rajasthan- Pakistan border was fenced and flood- lit by 1999. “Due to this, terrorism and other anti- national acts from across the border have been checked,” said a Parliamentary Standing Committee report on Border Fencing. Indo-Pakistan border - Construction of 340 Km of border roads and 137 Km of link roads along Pakistan border in Gujarat sector had been sanctioned, of which 294 Km of border roads and 136 Km of link roads have been completed. Challenges remained on the contentious Line of Control in Jammu & Kashmir and the unfenced 93 km of Rann of Kutch in Gujarat. India caught 128 infiltrators from Pakistan in 2006 and as many in 2007. Some 123 Pakistani infiltrators had been caught till November 2008 and there were two instances of armed Pakistani men cutting the fence in the Jammu Sector. BSF proposed shifting of 23.380 Km of fencing closer to the border in certain stretches of Ferozepur sector in Punjab due to the problems being faced by the farmers in cultivating their lands. Cost estimates of the proposal are being worked out by CPWD. The work commenced during 2007-08. A total length of 462.45 Kms and 461 Km had been fenced and flood lit respectively by 2008 in the entire Punjab sector, except some gaps in riverine areas. In Rajasthan sector also, the work of construction of fencing and flood lighting in 1048 Kms and 1023 Kms respectively had been completed except certain shifting sand dune areas. In Jammu sector, the work of construction of 185 Km of fencing had been completed. 175.50 Km of floodlighting works have also been completed and work on 9.96 Km will be undertaken after realignment of fencing. Work of floodlighting in a length of 0.54 Km is in progress in 2008. With the sealing of Punjab and Rajsthan borders, vulnerability of Gujarat border to infiltration and other illegal cross-border activities increased. Therefore, the Government approved a comprehensive proposal for erecting fencing, flood lighting and construction of border/link roads and Border Out-Posts for Border Security Force in the Gujarat sector of the Indo-Pak border. As of 2008, 217 Km of fencing and 202 Km of flood lighting had been completed in the Gujarat sector out of 310 Km sanctioned. There was a "time overrun" in completing the Gujarat project due to unforeseen circumstances and natural calamities including devastating earthquake in 2001, unprecedented rains and consequential floods in 2003 & 2006. The cost of the project has also increased considerably due to price escalation, increase in the scope of work, upgradation of specifications for roads and electrical works etc. In addition, an expenditure of Rs.223.00 crore is estimated for upgradation works as per Central Road Research Institute (CRRI) recommendations after floods in 2006. Approval of the Cabinet Committee on Security for extension of time for completion of fencing/floodlighting project in Gujarat sector and revised cost is being obtained. By 2011 there had, been some improvement in the responses of the Army, para-military and State Police security grid across J&K, and significant gains from the construction of the border fence along the Line of Control (LoC) and international border in the State. It remained to be seen, however, whether these will be sufficient proof against another cycle of unconstrained terrorism that would almost inevitably follow the withdrawal of the Western powers from Afghanistan in 2014. It is well known that before 9/11, Pakistan was a state sponsor of terrorism, particularly against India. Since 9/11, however, President Musharraf has diligently worked to put a lid on the terrorist groups in his country. On 18 April 2005, President Pervez Musharraf and India's Prime Minister Manmohan Singh signed a declaration heralding a peace process that they announced was irreversible. Since then, cross border terrorist attacks from Pakistan into India declined by 60 percent. 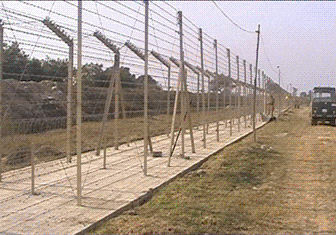 An Indian-built anti-infiltration fence along the border also contributed to the reduction in the cross border access by terrorists. Although final resolution between the two countries seems distant, there appears to be little desire for return to military confrontation or sponsorship of terrorism. Separatist terrorists and insurgents staged hundreds of attacks on people and property in 2004, especially in Jammu and Kashmir, in the northeastern states, and the "Naxalite (Maoist) belt" in eastern India. The Government noted a significant decline in infiltration from Pakistani Kashmir during 2004, attributing the drop in large part to the fence it constructed during the year-long cease-fire with Pakistan and more effective counter-insurgency methods. Nevertheless, in Jammu and Kashmir insurgent and terrorist groups made numerous attempts to kill Indian and Kashmiri politicians, targeted public areas frequented by tourists, and attacked security forces. Pakistan protested India's fencing the highly militarized Line of Control. Initially, due to heavy fire from across the border, in a stretch of 38.015 Km IPB fence was erected at a distance, varying from 400 meters to 1.5 Km away from the IB. After the ceasefire, there were representations from the border inhabitants, political parties and others to shift the fence closer to the IB. The matter was accordingly examined and it was decided to shift 38.015 Km of fencing erected on Jammu International Border close to the border to facilitate the border inhabitants to cultivate their lands without problems. The estimated cost of the proposed shifting of fence will be Rs.28.34 crore. The work of shifting the fence was undertaken during the year 2007-08. 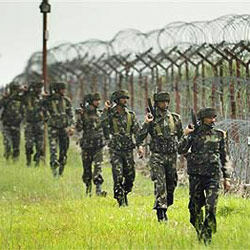 By June 2012 the Indian Army hoped to commence repair work on the three-tier border-fencing after the smoothly conducted commander-level talks between India and Pakistan held in Jammu and Kashmir's Poonch sector. The Brigade commanders meet was to discuss various issues after cease fire violations and to allow repair work on the damaged border fence. Pakistan had earlier objected to the fresh construction with regard to border fencing but allowed the Indian Army to go ahead with repair work. Due to heavy snowfall, various stretches of the border fencing had been washed away and the Army needs re-constructions in those sections. The brigade commander-level meeting took place on the 23rd of June to discuss border fencing repair work, restart of LoC trade, ceasefire violations and other issues. The Indian state of Jammu & Kashmir share a 740 km LoC with Pakistan. The damaged fences need to be urgently repaired since these stretches of open fences are infiltration points for the militants after the snow starts melting in summer.